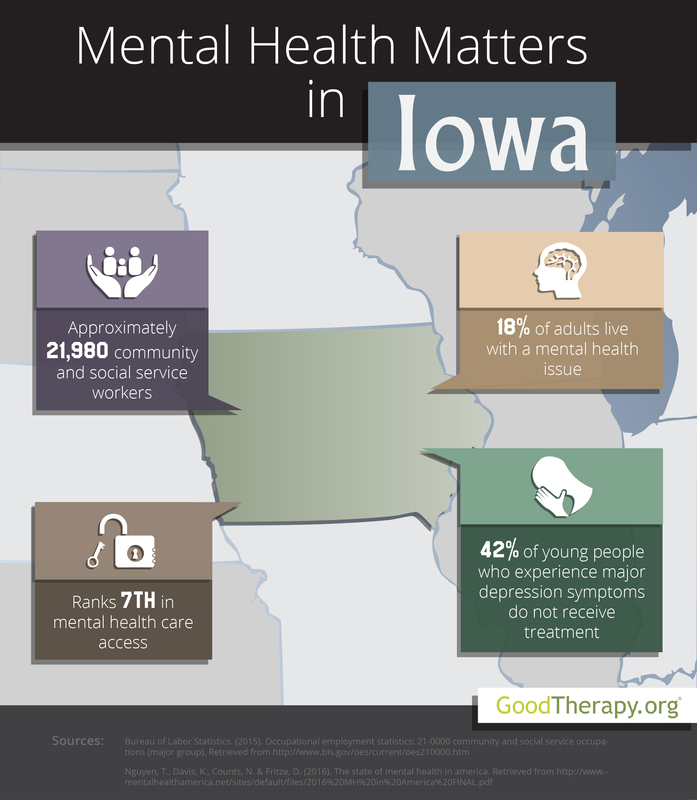 Find a therapist in Iowa with GoodTherapy.org. The U.S. Census Bureau indicate Iowa had a population of 3.1 million residents in 2015. Of this total, nearly 16% of residents were 65 or older, and 23% were younger than 18. Approximately 21,980 residents worked in social service and community related fields, according to data from the Bureau of Labor Statistics. Jobs within these fields included working as psychologists, depression therapists, counselors at drug and alcohol detox centers, residential treatment center employees, health educators, community health workers, guidance counselors, and marriage and family therapists. In Iowa, individuals in these and other related professions took home an average salary of $40,990. After being evaluated by Mental Health America (MHA) for statewide mental health conditions, resources, and practices, Iowa received an overall rank of 8th in the U.S. The researchers believe several social factors—such as high rates of graduation from high school, low rates of unemployment, and low rates of homelessness—correlate with the state’s overall ranking. Iowa was among the top 10 states in several major mental health categories, placing 4th in adult ranking, 8th in youth ranking, and 7th in access to professional care. Despite these high rankings that show people in Iowa generally have low rates of mental health conditions and high rates of access to care, the state was ranked a slightly lower 18th for overall prevalence of mental health issues. The 2016 MHA report suggests 18% of people in Iowa experience mental health issues, 8% show signs of dependence on drugs or alcohol, and 4% have thought about suicide. Iowa was ranked 14th, 11th, and 39th in each of these respective categories. The data also suggests Iowa residents with mental health issues are benefiting from available health care services in the state; Iowa had the second-lowest number of affected adults that did not receive treatment, the seventh-lowest percentage of adults with a disability who could not afford treatment, and the seventh-lowest percentage of adults with mental concerns who were uninsured. Iowa also received high rankings from MHA in several adolescent mental health metrics. The state was 3rd in abuse of drugs or alcohol among adolescents; 2nd for younger individuals who experienced major depression and did not receive treatment; 10th for students identified as having emotional issues for an individualized education program (IEP); and 6th for children with private insurance that did not provide coverage for emotional and mental health issues. Nevertheless, therapists in Iowa have identified a need to assist young people with severe symptoms of depression. According to the MHA survey, Iowa ranked 38th for young people with severe episodes of major depression, and 35th for young people with severe depression symptoms who received consistent depression treatment. Both these rankings show a high prevalence of mental health issues among adolescents.